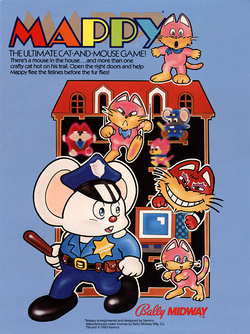 It's a cat-and-mouse game like no other as you take control of Mappy, a brave police-mouse. 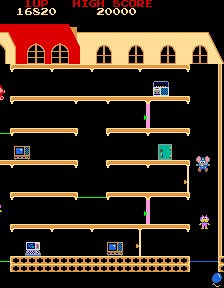 Arguably the most popular game in the first batch of arcade releases, Mappy follows the formula of other succesful titles of the time, including Namco's own Pac-Man - Your job is to collect objects while avoiding all enemies. The premise is that a gang of cats, called the Mewkies, have stolen a bunch of.. It's a cat-and-mouse game like no other as you take control of Mappy, a brave police-mouse, in this arcade classic! A gang of thieving cats have stolen treasures from all over the city and brought them back to their mansion! 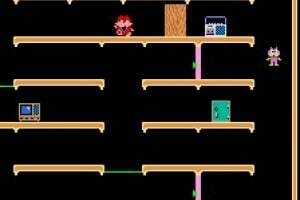 Your job is to infiltrate their mansion and negotiate traps, trampolines and dead ends to find all of the treasures and bring them back to their rightful owners. But watch out! Nyamco and his hench-cats are stalking the mansion and if they find you, you're finished! Yes! 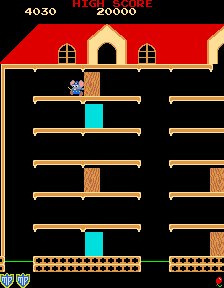 Mappy was one of my favorites growing up. Awww, yeah! 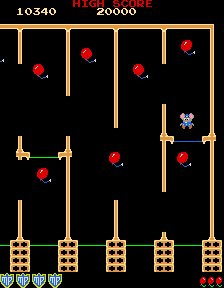 Great arcade game. Oh yeah, excellent game. Already got it at one of those Namco TV Game Plug-and-plays, but might download it here for convenience's sake. 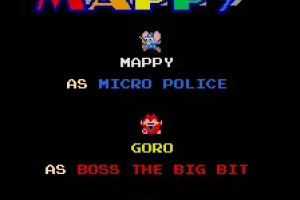 I love mappy awesome arcade title! 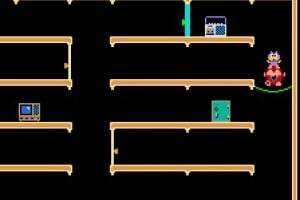 Wow the countless hours I used to spend on this game while my mother was shopping in the grocery store. 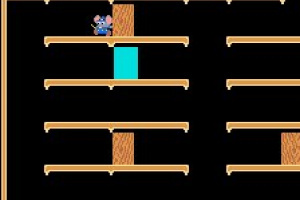 I can still hear that catchy tune playing in my head to this very day. I've never played this but I really wanna get it. It's the most appealing game of all the ones we got today, IMO. I already have this on 2 collections, but this still is a great game! @ post 7: Its also probably the best one released today.. Absolutely. Gaplus is good, but no classic, Starforce is old and outdated, and Druaga is not amazing, and a very aquired taste. 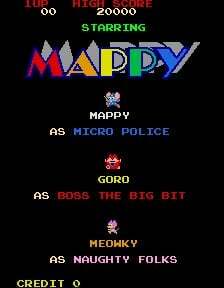 Mappy is one of Namco's bigger titles, found just below their most recognized games. I think if we just got one of these games there would have been complaints. I have it. Thanks! 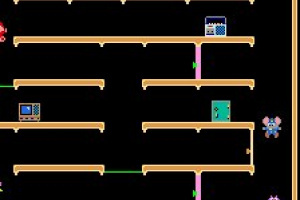 Virtual Arcade was a dream... OH! Now is reality! thanks again! I am so emotional! I do like this game, but I think I probably already have it on some collection or other (not sure; what collection is it on?). 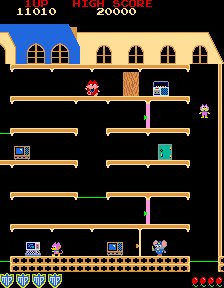 I'd much rather have Mappy Land for NES on VC. I'm kind of surprised it isn't up there yet, actually. Oh, well. 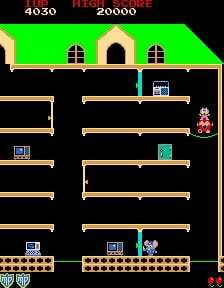 I think I still have my NES copy, anyway. To get or not to get that is the question. Downloaded this. Love it. More please. 5 bucks? Its just an arcade game! 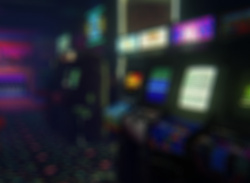 News SD Card Game Launching + Arcade Games Available on VC Now!